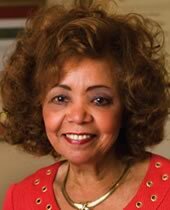 In July of 2006, after the age of 65, Dr. Marvalene Hughes honored a seemingly impossible promise to the students of Dillard University. Installed as Dillard’s new president in July 2005, Dr. Hughes’ promise that the 2006 graduating class would march through the stately oaks on campus might not seem extraordinary. But knowing that Dr. Hughes made this declaration shortly after the school was destroyed by Hurricane Katrina… while every campus building and tree was drowning under 10 feet of floodwater, you will recognize the enormity of her promise. Honor and sacrifice are qualities that require many years of life experience to truly understand and even more to embrace. Dr. Hughes embodies these traits to a nearly unprecedented level. While thousands of New Orleans residents left their life-long home following Katrina, Dr. Hughes chose to make it her new home. Imagine… just days after moving to New Orleans and starting a new job, her school is ten feet underwater and not likely to survive. You have no roots here, no family or friends. Why do you stay? Why do you take a school with little chance of survival and stake your word that it will not only survive, but thrive? Why not return to the prestigious comfort of a California state university system presidency? Why? Because you made a commitment. Because you refuse to let the honor and tradition of Dillard University die under your watch. You know the burdens and demands will be staggering but you accept the sacrifice to make a positive difference in this world. Dr. Hughes is dedicated to making a positive impact and to creating progressive, lasting contributions. This includes the construction of two, new LEED-certified “green” buildings, to be completed in 2010. Amazingly, Dr. Hughes fulfilled her promise. The original, stately buildings were not only rehabilitated and refreshed, but were also transformed into state-of the-art laboratories for every academic discipline. The dead grass was replaced with new sod and incredibly, all but one oak tree survived. That single tree was replaced as a gift from the students, who dedicated that new symbol of life to their inspirational leader. Dr. Marvalene Hughes… Peoples Health Champion.